Georg Jensen Damask dates back to 1756. The Jensen family has had a weaving tradition since the 15th century. Thus the company from Kolding is the oldest textile company in Denmark and one of the oldest in Europe. The brand stands for high-quality home textiles in the luxury segment. Of course, the label proudly bears the title "Purveyor to her Majesty of Denmark". The collection includes table linen in particular tablecloths made of thick damask fabrics, uncoated and coated. Tablemats, fabric napkins and table runners also round off the segment. The elegant satin bed linen made of soft and breathable Egyptian cotton must also be emphasized. The fiber is particularly soft and gives a special feel-good effect. The patterns are simple and discreet, as is typical for Scandinavian designs. Accessories such as bedspreads, wool pillows and blankets are also offered by the Danish brand. Of course, the blankets and wool pillows can also be used in the and outdoor. The terry collection is also characterized by particularly fluffy and absorbent toweling fabric. Due to the excellent weaving techniques. Even individual damaged fibers such as those caused by nail scissors or a ring are no problem. The thread is torn out, and the damage is gone. For a home textile weaver, kitchen textiles such as tea towels and dishcloths are of course also part of the collection. The drying properties and absorbency of kitchen textiles are unmatched in Scandinavia. With tea towels such as those from Georg Jensen Damask, even drying is fun, not to mention the fantastic dishcloths. The dishcloths are real bestsellers in Denmark. Cleaning makes fun and environmentally friendly. Among the designers are personalities such as the Danish architect Arne Jacobsen, the Norwegian Andreas Engesvik, the designer couple Salto, Nanna Ditzel, Susanne Brenøe and Jette Nevers. Brushed yarn is the highest quality yarn and the fabrics feel better and are more robust than fabrics made of brushed cotton. Cecilie Manz graduiert von Danmarks Designskole 1997. 1998 gründete sie ihr eigenes Designstudio in Kopenhagen. Seit 2005 arbeitet Sie als Designerin für Holmegaard. Ein großer Erfolg ist Ihre minimalistische Serie rund ums Thema Wasser Minma geworden. 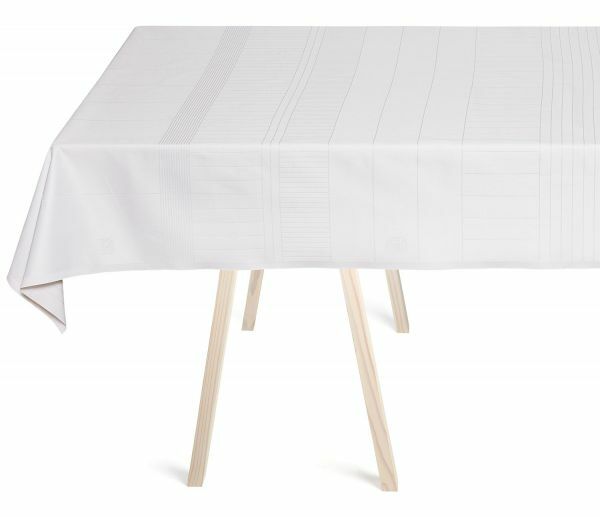 Customer evaluation for "Georg Jensen Damask Still Life tablecloth white"